Our website, is one of the most secure online shopping web sites (https://www) you will ever come across in South Africa – certified and approved by Google. Be 100% confident that your personal information is extremely secure, every step of the way. 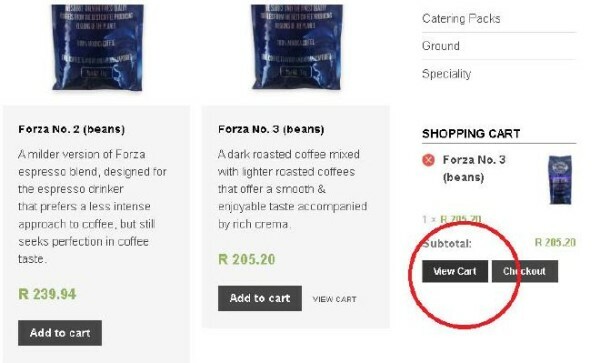 You will go though the following process only once: the 1st time you place an order with Mostra Di Cafe registering an account (all though registering an account is also optional – your purchase can be a “once off” one). Thereafter, your details (name & surname, address, etc.) will be safely kept by the system so you do not have to go through the process ever again. 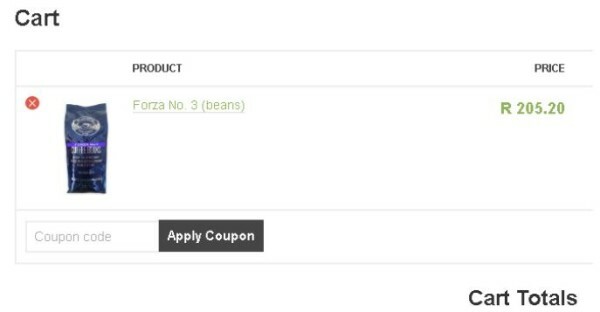 1) You can choose products and add them to your cart from any page within the website. Let’s assume though that you would like to choose the products by clicking on the “Shop” tab and then on the “Buy Items” tab. 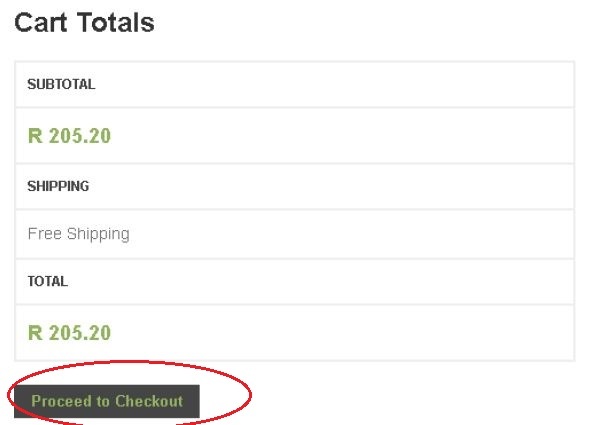 2) Choose the product(s) you want by clicking on “Add to cart” button OR “Select Option” (if “Select Option” is chosen, select the option over the product chosen and click on “Add to Cart” button). 3) When finished choosing / placing items and you are ready to check out, click on “View Cart” tab (this tab can be found on the right side of your screen). 4) Once in the “Cart” page, and you have a discount coupon, enter the code in the “Apply Coupon” window and then click on “Apply Coupon”. 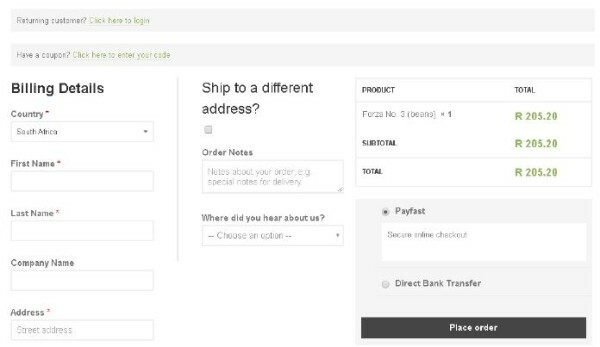 5) Click on the “Proceed to Checkout” tab. > Choose the way you want to pay: Payfast (for all Cards) Direct Bank Transfer (for EFT) and proceed by clicking on the “Place Order” button. 7) The next screen will ask you to enter your email. Once this is done, press “CONTINUE”. 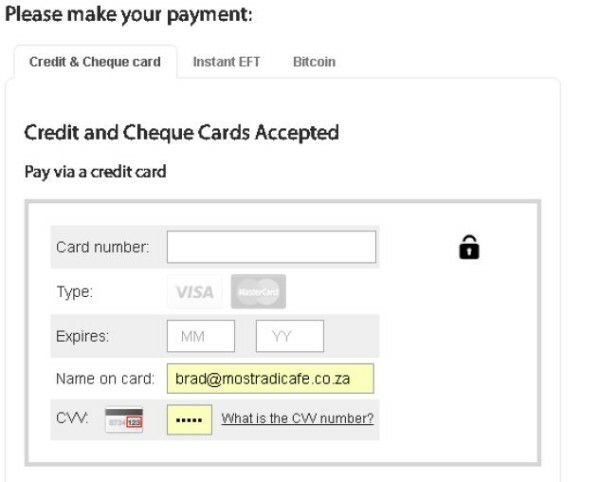 8) Select your payment method (VISA/MASTER CARD – EFT – BITCOIN) by clicking on the relevant icon. 9) Clicking on the “Card” icon, will take you to the next screen where you need enter: Card Number, Expiry Date, Name of card holder, CVV number (the last three digits at the back of the card). Once done, click on the “PAY” button. A small pop up window will appear asking you to enter your card’s pin number. 10) You are done and you are going to be seeing the following screen confirming that your payment was successful. Your order is instantly received by our e-commerce desk for processing while in proof of this you will also receive an email (within minutes) confirming that your order was received. 1) On the main page of the website, hover the mouse pointer over the “Shop” tab and click on the “Login/Register” button. 2) In the Login/Register screen, enter your “Username” and “Password” in the relevant fields and click on the “Login” button.